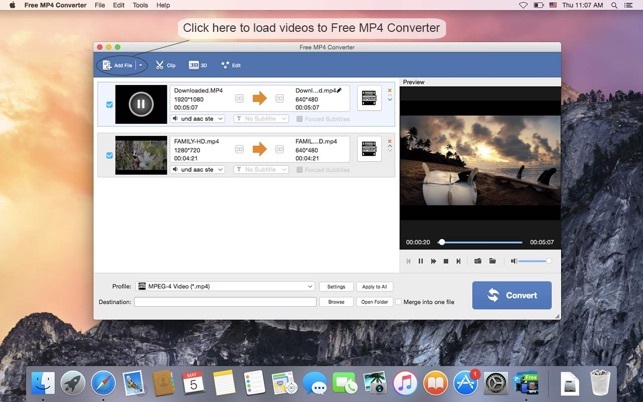 Free MP4 Converter is professional MP4 Video Converting software, which helps you convert any video format to and from MP4 video for playback on iPhone (iPhone X/8/7/SE/6s/6s Plus/6/6 Plus/5s/5c/5/4S), iPad (iPad Pro/Air 2/mini 3/4/Air/mini 2), iPod, and Apple TV. It also supports converting video to HD MP4. It makes it easy to convert 4K/HD videos and common videos like MOV, MTS, MKV, FLV, AVI, WMV, F4V, WebM, WTV, and more to MP4 formats in batch. 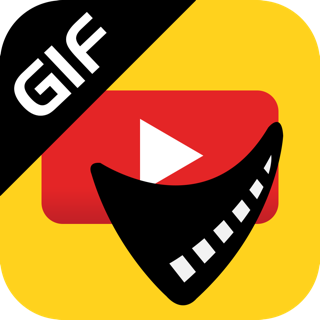 You are allowed to convert HD video, AVCHD video, and common video like AVI, WMV, FLV, MOV, MPEG, M4V, MPG, 3GP to MP4 format. You can play the converted video/audio files on diverse multimedia players like iPhone X/8/7/SE/6s/6s Plus/6/6 Plus/5s/5c/5/4S, iPad Air 2, iPad mini 3, iPad 4, iPad Air, iPad mini 2, iPad mini, and iPod touch. You can enjoy your favorite videos anytime you want. Apart from MP4, you can convert your videos to many other formats, like MOV, M4V, AVI, MPG, FLV, MP3, etc. You can even upscale SD video to HD, or upscale SD/HD to 4K. More output formats give you more options. You can play or edit your videos with more players and editors. Free MP4 Converter provides you with various video editing functions. 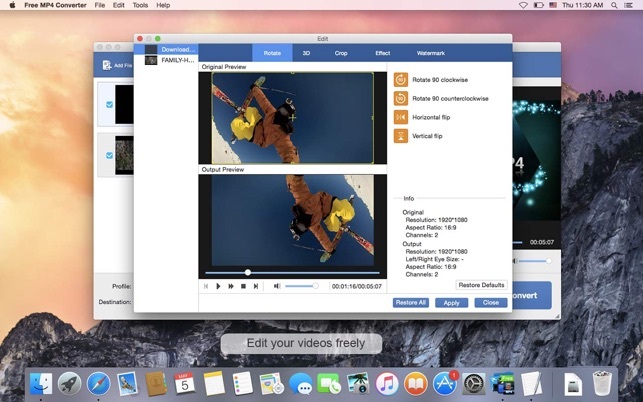 For example, you can cut off unwanted parts in a video, or merge several videos into one. Also, you can adjust video brightness, saturation, hue and other parameters, crop the video area to make it fit your screen, or add watermarks to your video. After the new upgrade, now it allows you to rotate and flip the video. In the "Profile Settings" window, you’re free to modify the video and audio output settings. For the video settings, you’re allowed to adjust encoder, frame rate, resolution, aspect ratio and video bitrate. In addition, the audio settings like encoder, sample rate, channels and audio bitrate are also at your disposal. 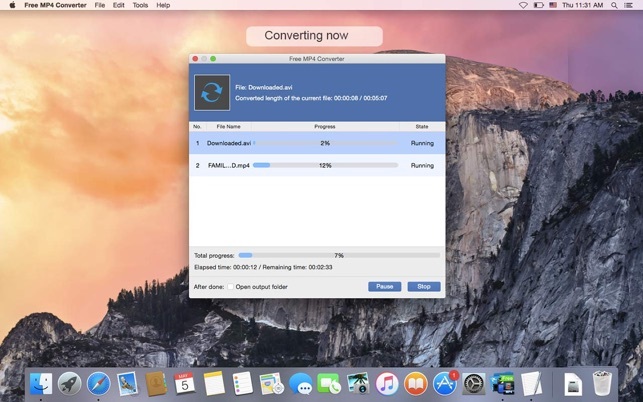 Free MP4 Converter App support batch conversion. You can convert your video files to multiple different video formats, which greatly save your time. 1. 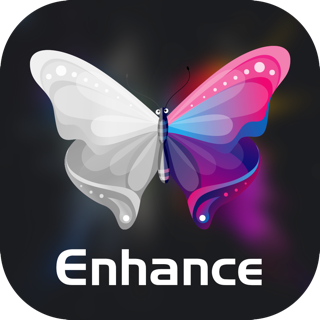 We updated this program to make it fully support 64-bit processor. 2. Improved the stability when converting videos to MP4 format. 3. 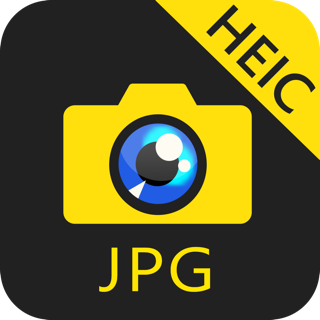 Improved the H.264/H.265 encoding decoding ability. Are you kidding me? I have been looking for this application for years! I am a Los Angles based producer who does a TON of video editing. It’s stunning how many clients will bring in source video material in avi format. Final Cut Pro has never liked avi. I’ve used a handful of other video applications and they have all been wonky. I downloaded this in 2 minutes started dropping in avi files and VIOLA – I converted them all to mac friendly files – fast and easy. I’m stunned it’s taken so long to find this application. 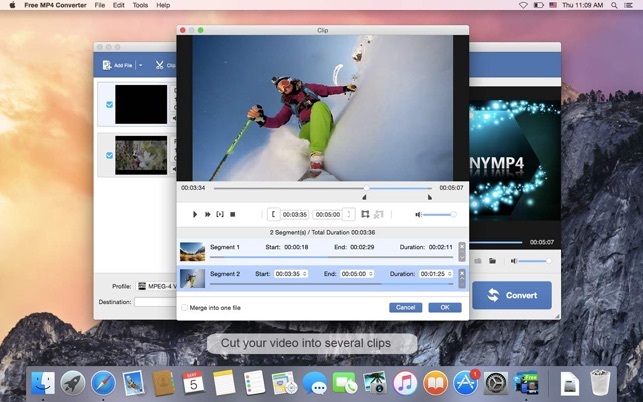 This is a MUST have app for every mac owner who does a lot of work with video. Seriously – thank you for developing this – it’s excellent! Thank you for your valuable comment. We are so glad that our product has been helpful to you. We’ll keep improving our products to make them better. Please pay close attention to us. Thank you! I feel this app needs more reviews of love. I searched forever trying to find a way to put my movies onto apple devices since they are so picky. I tried to force applications through the terminal to make them work, and they still couldn’t convert or rip the way I want. Finally I decided to search the app store and boom…I couldn’t be happier. I do use other programs to rip my dvd’s, however it defaults to .mkv and so this converts to .mp4 for me. Perfect little program, and even includes subtitle encoding! 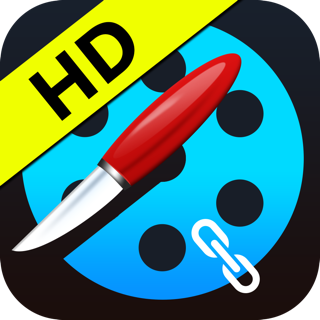 Please download this app if you like your movies on the go like me. Thank you for your valuable comments. We couldn't be happier that our product has been helpful to you. We’ll keep improving our products to make them better. Please pay close attention to us. Thank you! As a filmmaker that works on many different cameras from time to time, I was having trouble figuring out a smooth workflow for MTS files. I couldn’t get VLC to output into anything that would talk to mac and couldn’t afford to buy a fancy program. However, after opening this app (and after some tinkering to get the highest bitrate and size possible), I was able to convert MTS into MOV. I probably could have converted the MTS into a cheeseburger, if I wanted to. Great app, runs fast, does everything I could possibly want.